Prime Minister Narendra Modi was left embarrassed on Sunday as angry protests against his visit to Tamil Nadu led to a social media hashtag #GoBackModi become number one global trend on Twitter. The protests both on the ground in Tamil Nadu and Twitter were launched ahead of Modi’s planned trip to the state to attend the foundation-laying ceremony of the All India Institute of Medical Sciences (AIIMS). People in Tamil Nadu are angry with Modi for his refusal to visit the state when it was ravaged by cyclone Gaja that left more than 3 lakh people homeless, while crippling the lives of a large swathe of the state’s population. More than 11 lakh tress too were uprooted by the nature’s fury last year. Modi has always been accused of visiting states only when there’s an opportunity for him to extract the electoral mileage. In the last assembly elections, the state had rejected the saffron party as it failed to win a single seat. Many alleged that the real purpose of the Modi’s visit to Tamil Nadu was to form an alliance with the regional parties in the state ahead of this year’s Lok Sabha polls. 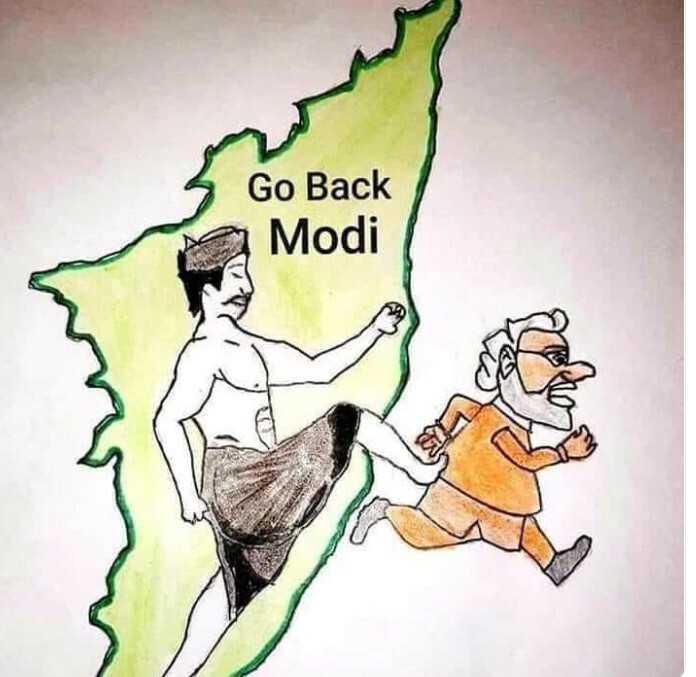 Most dominating image of the trending hashtags on Twitter was a amp of Tamil Nadu bearing the message ‘Go Back Modi,’ while a local Tamil farmer is seen disparagingly kicking the prime minister out of the state. On Sunday, black flags and balloons welcomed Modi as he arrived in the state. #GoBackModi is trending at no. 1 from last 12 hours. Although, supporters of Modi trended #TNWelcomesModi, it was no no match to the hashtag #GoBackModi. Another hashtag #GoBackSadistModi too occupied a top trend and had nearly 70,000 tweets posted under the hashtag. #GoBackModi had received nearly 4 lakh tweets posted under the hashtag. While #TNWelcomesModi had only 1,47,000 tweets posted under the hashtag. This is not the first time, Modi had to face the wrath of people of Tamil Nadu. Last year in April, in an another unprecedented development, Modi was forced to cancel his road show and instead take helicopter to reach the function venue in Chennai because of the growing protests against him.